I found this smooth green snake (Liochlorophis vernalis) near a small river on the west slope of the Sangres north of Santa Fe. It was apparently eating some kind of small black beetle which was abundant in the bush over the snake. It bluffed a strike by holding its mouth open, which was dark purple inside. What a beautiful little snake! I hate to admit it, but after letting this go last night after reading this post on boing boing, my annoying spelling ocd has gotten the best of me. I apologize in advance for inflicting my pedantry on you. Okay. There is no accent over the "e" in the word "sangre." One more time, v. v. sorry. Thanks for the grammar info. No need to apologize. i congrautes you for further adventure. oh, i've always wanted a smooth green snake but my dad hates snakes and doesnt believe it when i say that all snakes arent venemous. Would you know of any chain stores that would sell snakes just like that? if that snake bit someone would it hurt? From what little I know of this species, it's not the easiest to keep captive. I've never seen them in any pet store, including reptile specialty stores. The bite would be completely harmless. You'd probably have to be ultra-sensitive to even be bothered to feel it. You'd get more of a sense of the bite from the visual cue of watching it bite than feeling the bite. 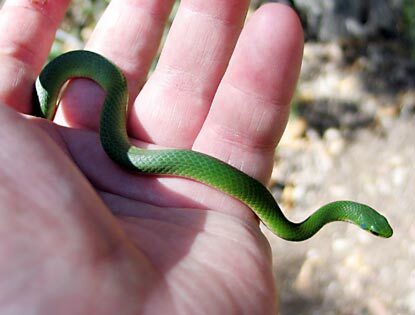 I live on the upper Canyon Road area in Santa Fe and stepped on one of these green snakes yesterday in my lawn. Fortunately, I was wearing soft sandals and the snake was unharmed. Scared the you know what out of me as it slithered against the skin on my foot. Being a lifelong SF resident, I had never seen a bright, lime green snake before so I was a little worried about it being poisonous (Costa Rican flashbacks). Glad to hear it's not poisonous. The snake was about 8 inches long and maybe a half an inch wide. Thanks for the great info!